Seattle police have released a video showing footage filmed during an investigation as well as re-creation of a June 2, 2018, homicide near Luna Park in West Seattle. Jonathan Pecina, 22, was fatally stabbed in the neck June 14 in West Seattle. His killer left his DNA at the crime scene but it doesn't match any profiles in law enforcement databases. 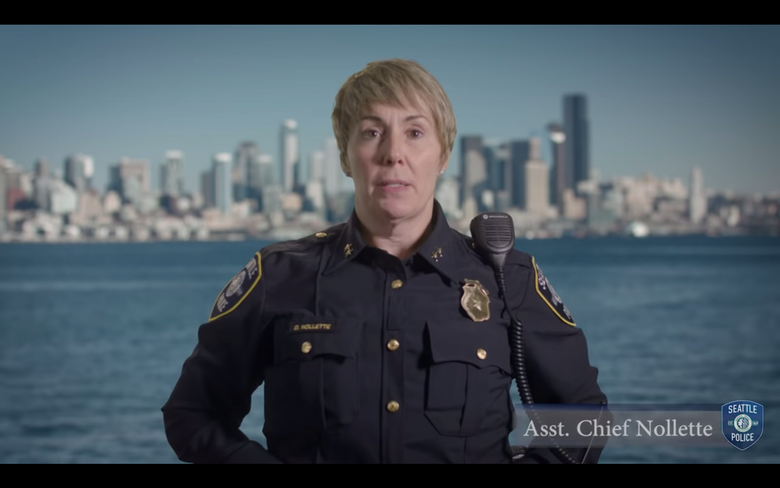 In an effort to shake loose some leads, the Seattle Police Department produced a video about the unsolved homicide. Speaking directly into the camera, Seattle Assistant Police Chief Deanna Nollette assures an unidentified killer that homicide detectives have a pretty good idea of what happened the night Jonathan Pecina was stabbed in the neck and appealed to the perpetrator to come forward. “This case will never go away. We have your DNA. It is in your best interest to contact us immediately,” Nollette, who heads the Seattle Police Department’s Criminal Investigations Bureau, says near the end of a three-minute video posted on the department’s online blotter this week. Titled “We Need Your Help to Solve a Murder,” the video includes surveillance footage, video from officers’ body cameras, crime scene photos, photos of evidence and footage of Nollette, dressed in her dark-blue uniform with city skyline in the distance. Dramatic music plays in the background. Pecina, 22, was fatally stabbed the night of June 2 near Luna Park, a T-shaped promontory that juts into the water on Duwamish Head, the northernmost point in West Seattle where Harbor Avenue Southwest curves into Alki Avenue Southwest. It’s the first time SPD has ever produced a public-service announcement video showcasing evidence from a homicide investigation, Nollette said in a phone interview Thursday. It’s an experiment that recognizes the growing importance of social media for disseminating information, she said. She couldn’t say how much the video cost since it was produced in-house with the department’s existing budget. Homicide detectives worked with Nollette and the department’s media unit on the script and the video production unit – comprising officers who are responsible for collecting video evidence in criminal cases and shooting footage of crime scenes – filmed and produced the video, Nollette said. Nollette confirmed that the killer’s DNA was found at the scene and is male. But his profile didn’t match any DNA in law-enforcement databases, she said. An Atlanta Braves baseball cap, which was photographed on a sidewalk alongside a knife sheath, is believed to have belonged to the killer, Nollette said. But she declined to discuss the evidence in detail for fear of jeopardizing the investigation. DNA from cold-case homicides has led to killers through genetic genealogy — essentially identifying suspects through the DNA of relatives who used sites such as Ancestry.com or 23andMe to generate their DNA profiles and uploaded them to GEDmatch, a public genetic-genealogy website. Though SPD has used the process in some cold cases, Nollette said detectives have not done so as part of the Pecina investigation but didn’t rule it out. But the point is to document the violence of the evening and show the victim as a real person, she said. It’s also a call to action, and the hope is the video is compelling enough to get the killer, or someone he’s confided in, to come forward. At the start of the video, Nollette notifies viewers that what they are about to see is redacted photo and video evidence from the night of the killing, and she warns that the video includes disturbing content. She then describes how Pecina and his friend encountered another man – and how a verbal confrontation between them morphed into a fight. Pecina, she says, “was stabbed in the neck with a large knife.” The killer then ran off. During the recitation of events, body-camera footage shows a responding officer finding a blood-soaked Pecina lying on the sidewalk. Pecina’s face and the faces of witnesses are blurred. The video then switches back to black-and-white surveillance footage, and clearly shows an officer performing chest compressions with the Space Needle lit up in the background. “Unfortunately, Mr. Pecina died from the stab wound,” Nollette says, her voice accompanied by a photo of Pecina’s shrouded body on the sidewalk. She then talks about the steps taken by the department’s homicide and crime-scene investigation (CSI) units over the past five months, and the items analyzed by forensic scientists at the Washington State Patrol Crime Lab. The last image is of a sidewalk memorial, with bouquets set in beer bottles and a row of devotional candles lined up near a scattering of small, white prayer candles. “Please help the Seattle Police Department bring closure to the Pecina family,” Nollette says as the screen fades to white. Anyone with information is asked to call SPD’s Homicide Unit at 206-684-5550 or the police tip line, 206-233-5000, and reference case number 2018-199794.